The myotendinous junction (MTJ) as the interface between muscle and tendon is known to be the weakest link in the muscle-tendon chain, and ultrasonographic visualization of muscle strain injury in humans indicates that tissue damage involves the MTJ. Microscopy of experimental load-to-failure strain injuries in animals has revealed that the actual site of rupture is rarely the muscle-tendon interface, but rather the A-band of the distal sarcomeres close to the MTJ. Studies of MTJ by electron microscopy show a typical pattern of tendon-muscle interdigitations with the shape as ﬁnger-like processes. These ﬁnger-like processes are in fact ridge-like protrusions of collagen-rich tendon inserting into furrow-like indentations of the muscle. They provide a greater surface area between muscle and tendon through which force is transmitted. Little is known however regarding the composition of the matrix constituting the MTJ and endomysium surrounding the adjoining ﬁbers. The main aims of this study were to describe the distribution of macrophages and matrix proteins in human MTJ and adjoining muscle ﬁbers and to investigate the inﬂuence of heavy resistance exercise on this distribution. Fifteen patients (age 34 ± 8 years) were enrolled for the study. The patients were healthy except for an isolated anterior cruciate ligament (ACL) rupture and scheduled for ACL reconstruction surgery using a hamstrings-graft (gracilis and semitendinosus tendons). The subjects were randomized into three groups: a control group (ﬁve males), an acute training group (four males, one female) or a long training group (heavy resistance exercise, HRE; two males, three females). The control group did not train, the acute training group trained once prior to the surgery and the long training group trained three times weekly for 4 weeks. The subjects were told not to do other resistance exercise or hard aerobic exercise during the study period. The acute group did one training session 2–3 days before their surgery. This period was chosen because acute increases in concentrations of macrophages and Tenascin-C are detectable a few days after a training session. Six exercises were selected to train quadriceps and hamstrings muscle groups. Quadriceps exercises included leg press and leg extensions. Hamstrings exercises included Nordic hamstring, lying leg curls, supine one-leg curls, and reverse hyperextensions (posterior chain exercise). The training sessions were all supervised and for all exercises subjects performed 3 sets of 6– 8 repetitions. On the day of surgery, the samples of the MTJ from the semitendinosus and gracilis muscles were harvested before the tendons were prepared as graft for the ACL reconstruction. The samples were sectioned and stained immunohistochemically for collagen types I, III, VI, XII, XIV, XXII, Tenascin-C and CD68. Macrophage density and distribution was evaluated and the amount of each collagen type in muscle and MTJ was graded. Collagen XXII was observed to be strongly expressed exclusively in MTJ. All other collagens were abundant at the MTJ and in muscle perimysium or endomysium. 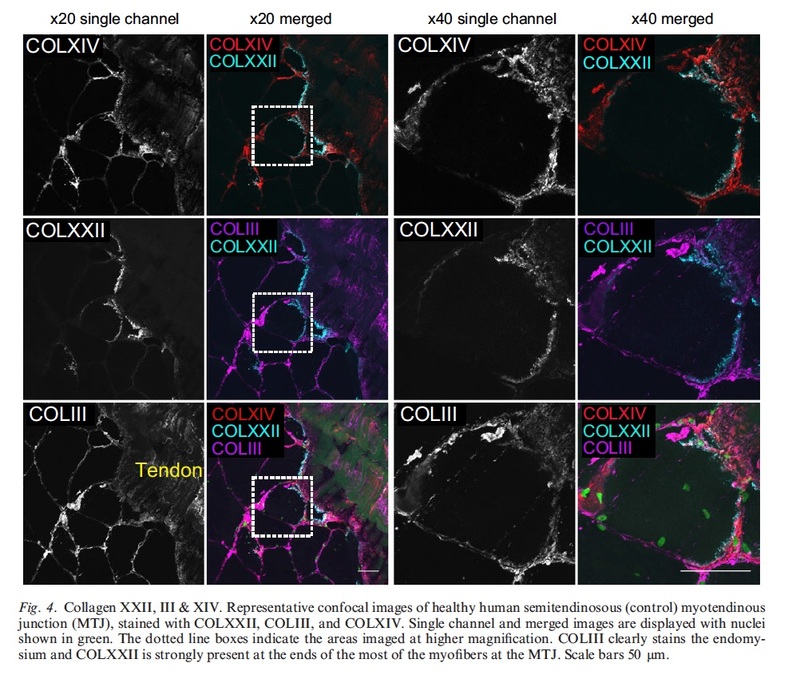 An equivalent to 56.7 ± 9.6% of the entire MTJ length in the control samples contained collagen XXII, as compared to 52.7 ± 13.3% in the long trained subjects. Tenascin-C was found to be expressed to a greater extent in the acute trained muscle tissue (P = 0.024) and in the long trained muscles (P = 0.013) when compared to control samples. The expression of collagen XIV in muscle tissue was found to be elevated in the training vs control group (P = 0.014). The acute training group had similar numbers of CD68+ cells inﬁltrated in the muscle tissue to that observed in the controls. However, a greater concentration was seen in the long trained muscles compared to controls (P = 0.016). At the MTJ, macrophages were found to a similar extent in all groups. The ﬁndings illustrate the heterogeneity of collagen type composition of human MTJ. The observed increased collagen XIV and macrophages content between muscle ﬁbers at the MTJ indicates an important role for these adaptations in the strengthening of this tissue area. Further insight into the composition of human MTJ and loading-induced adaptation may contribute to the basis for development of strategies to strengthen this injury-prone region.